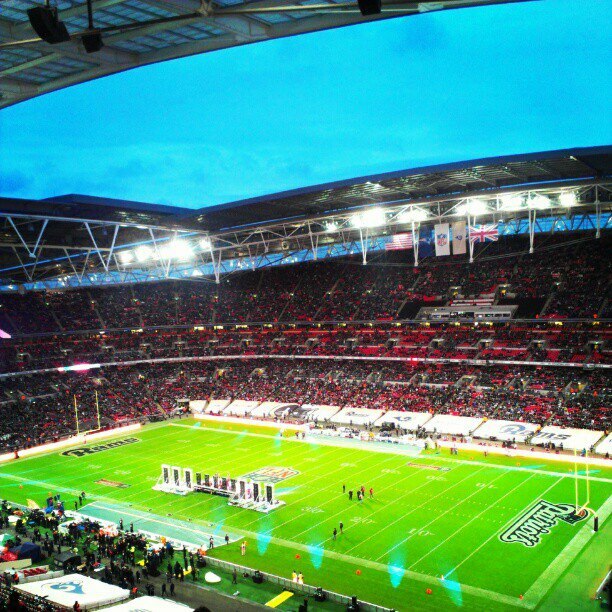 Camilla Chappers: NFL touches down in the UK! The National Football League touched down this weekend in London for an epic show of American Football, food and just generally American-ness, and I had the pleasure of going along! But will American Football ever really take off in the UK? I'll admit before I start writing - I used to not like American Football. The amount of times it started and stopped just bored me. And I used to hate the fact my beloved Wembley turf would get shredded with these Yanks coming over and destroying the pitch with a game other than Football (soccer as it's called over in the US). Yep, I did not like American Football. So a group of us, all transformed into American Football fans in the space of a year, were in attendance at Wembley on Sunday - I LOVED IT. It was truly an epic experience - from the tailgate party outside to the actual game, and seeing Tom Brady and his New England Patriots thrash St Louis Rams. It was something I never thought I'd go watch but it was amazing - just the atmosphere the stadium seemed to have was awesome. I particularly loved all of the American type enthusiasm - always good! I also loved the pre-game show done by one of my favourite bands Train - they sounded fantastic. But will it ever take off here in the UK? Well already it has done. With the start of the International Series in London in 2007, the game has continued to grow and grow here in Great Britain, with the prestigious Wembley Stadium playing host. This first game between the Miami Dolphins and the New York Giants sold out the first 40,000 tickets within 90 minutes of going on sell; this weekend's fixture was a sell out, with 84,004 fans attending. So it's clear NFL is growing here, with each year more and more fans are attending - again this is proved with the fact that two games will be held in London next year, giving us Brits more chances to see the stars of the NFL in action. Coverage on Sky Sports surely must have helped numbers, with often various teams trending on Twitter even in the United Kingdom. It may not be pulling in as many numbers as the now dreadful X Factor, but it is certainly growing. There are even times propping up all over the country, from my university's team right to television presenter Vernon Kay's team London Warriors. But I don't think it'll ever be totally accepted here. You still get people saying it's a silly sport, that they wear all of this protection whereas people playing other sports such as Rugby don't. You get people (like I was) complaining about the fact that Wembleys' pitch is being ruined in the process for what is in their opinion, a worthless game. Others ask why should we have the American's national game over here? Not everyone is going to accept this game but to be honest, does it really matter if everyone does or not? As long as the demand is here, and there are enough fans wanting to go to games and watching it on TV, then it doesn't matter. I for one will certainly be hoping to attend the games at Wembley again next year, and I hope many more of us Brits will be there too! It is a great sport to get into, a lot of fun so if this all sounds interesting to you, take a look around on the web and find out more about America's national game. Again, I'd love to hear your opinions on this! Next year's games at Wembley Stadium are Pittsburgh Steelers v Minnesota Vikings on the 29th of September 2013 and then San Francisco 49ers v Jacksonville Jaguars on the 27th of October 2013.